Large ladle. Backstamp: Adams England. There is a little wear and discolouration and a touch of crazing. Small ladle. Backstamp: Adams England. Minor signs of wear but overall excellent condition. A delightful little ladle with ochre rim and ochre highlights to the stem. Pattern inside the bowl only, and just enough room for the floral border and a little foliage - not a cow in sight! There is a small firing fault to the rim and a little minor wear to the stem otherwise excellent condition. No backstamp. Lovely large ladle with floral border pattern around the inside rim and rural scene to the centre. Backstamp: Adams, Member of the Wedgwood Group. Small rub and printing blemish to the tip of the stem and a couple of glazing blemishes to the outside of the bowl otherwise excellent. The scene to the centre of these ladles vary from piece to piece! This one has a cow reclining with her calf. The bowl is more shallow than usual. There is some wear around the rim and a little to the stem otherwise excellent condition. Blue printed backstamp English Scenic Warranted Staffordshire Adams England. Lovely large ladle with floral border pattern around the inside rim and rural scene to the centre. A little very minor wear to the rim otherwise in excellent condition. Black printed Adams marks. Fabulous small ladle with pattern inside the bowl and along the line of the stem. Also at the base and tip of the stem decorative embossed detail. No backstamp. Light all over crazing otherwise excellent condition. With gilt. Gorgeous little ladle with pattern on the inside of the bowl. No backstamp. There is some wear to the gilt and also a small rub to the rim of the bowl. Underneath are one or two minor blemishes, overall good condition. With gilt. Fabulous large ladle. No backstamp. Light all over crazing with a little wear to the gilt and underneath a small firing fault to the base of the stem. Delightful small ladle, overall length 7.5 ins. No makers mark, but definitely Booths. Fine crazing of the glaze. Lovely large ladle printed in a steely blue. No backstamp. The border pattern is a little hazy around the rim of the bowl and to part of the stem. There is some wear and pitting to part of the bowl rim and a little wear to the stem otherwise absolutely fine. Delightful little ladle with rural scene inside the bowl. No backstamp. A little minor wear otherwise excellent condition. Not marked Booths but printed in their distinctive steely blue with gilt. Attractive decoration to the end of the stem. Overall length 7.25 ins. Small rub to the rim. Not marked Booths but printed in their distinctive steely blue with a gilt rim. Ornate decoration to the end of the stem. Overall length 7.25 ins. Large ladle printed in a rich dark blue. There is a little wear around the rim of the bowl and to the stem otherwise absolutely fine. There is lovely moulded details in the shape of a leaf to the end of the stem. No makers marks. Large ladle with ochre rim. A little very minor wear, but overall excellent condition. With gilt. Stunning floral pattern highlighted with gilt. Crazed with a little wear to the gilt and a little minor discolouration underneath otherwise excellent condition. Beautiful large ladle with gilt. Full pattern to the inside of the bowl with and lovely moulded detail to the end of the stem. No backstamp. There is a little minor wear under the the tip of the stem and a tiny tiny firing fault at the base of the stem, overall it is in excellent condition. With gilt. Absolutely gorgeous small ladle made for Lawleys. Beautifully decorated inside and along the stem. Backstamp: Lawleys Regent St Estd Phillips's 1760. Lovely large ladle with handle applied colour and ochre rim. No backstamp. There is a little minor wear to the ochre rim otherwise excellent condition. With ochre rim and ochre line decoration along the stem. Pattern inside the bowl only. A little light crazing otherwise excellent condition. Not marked but definitely Booths. Large ladle printed in a steely blue and with lovely moulded details to the stem. No backstamp but this is Moyen pattern made by Britannia Pottery, Glasgow, Scotland. There is a little blue smudging here and there and a little minor wear but overall excellent condition. Pretty little ladle with pattern around the inside rim and to the tip of the stem. Backstamp: Just possibly Britannia impressed inside the bowl but too indistinct to be sure. A couple of minor manufacturing blemishes underneath otherwise excellent condition. This is lovely! 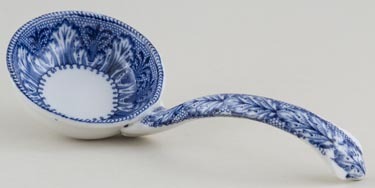 A small ladle with pattern printed inside the bowl and along the stem. This ladle is unusual in that it has the makers impressed mark underneath - B & L plus the impressed date for 1880. As for condition well the stem shows a few minor signs of age, but overall excellent. With gilt. 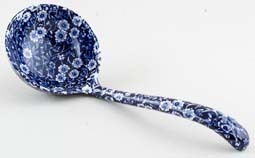 A pretty little ladle in a pattern that is more often seen with colour. This version however is just blue and white. There is wear to the gilt around the bowl and a few signs of age underneath and along the underside of the stem otherwise absolutely fine. The transfer is a little smudged in parts. Blue printed backstamp Premier B & L England. With gilt. Gorgeous ladle with border pattern around the inside rim of the bowl and to the stem. No backstamp. A little minor wear, otherwise excellent condition. No gilt version of this pattern. Fabulous large ladle. Backstamp: Burleigh Ware Willow Burslem England Made in England. Excellent condition. Made in England. Brand new and first quality, dishwasher and microwave safe. Black Asiatic Pheasants. This item has been discontinued by Burleigh and is no longer available. Made in England. Brand new and first quality, dishwasher and microwave safe. Dark Blue Calico. Suitable for use with the jam pot or on its own. This item has been discontinued by Burleigh and is no longer available. Made in England. Brand new and first quality, dishwasher and microwave safe. Dark Blue Calico. This item was produced by Burleigh as a limited edition and is no longer avalable. Dark blue Calico, made in England by Burgess and Leigh. Large ladle. Backstamp: Calico Burleigh Staffordshire England. Underneath the bowl there is a tiny rub resulting in loss of glaze and pattern otherwise excellent condition. Made in England. Brand new and first quality, dishwasher and microwave safe. Black Prunus. This beautiful traditional ladle, created from an original design from the 1800s, makes a lovely display item or is suitable for use. This item has been discontinued by Burleigh and is no longer available. Made in England. Brand new and first quality, dishwasher and microwave safe. Pale Blue Victorian Chintz. This item has been discontinued by Burleigh and is no longer available. Made in England. Brand new and first quality, dishwasher and microwave safe. Black Willow. This item has been discontinued by Burleigh and is no longer available. Made in England. Brand new and first quality, dishwasher and microwave safe. Brown Willow. This item has been discontinued by Burleigh and is no longer available. Made in England. Brand new and first quality, dishwasher and microwave safe. Plum Willow. Plum Willow. This item has been discontinued by Burleigh and is no longer available. A magnificent large soup ladle. The pattern is a bold floral design printed in a darkish blue and includes a large vase, butterflies and a bird. Made by Samuel and John Burton of Burslem, Staffordshire, who were in business from 1832 to 1845. The pattern name is a given one and it is sometimes known as Lovick's pattern after the Norwich retailer, whose printed backstamp has been recorded on this design. No maker's backstamp as is typical with this pattern. The glaze is finely crazed and there are a few signs of wear on the top of the handle, but otherwise in lovely condition, almost as new. Gorgeous little ladle with pattern on the inside of the bowl and along the stem. Excellent condition. Gorgeous little ladle with pattern inside the bowl and along the stem. No backstamp. There is a little minor wear underneath, mainly to the stem otherwise excellent condition. A gorgeous small ladle with pattern inside the bowl. Backstamp: Impressed Dimmock monogram. A little wear to the tip of the stem otherwise excellent condition. Fabulous large ladle with border pattern inside and outside of the bowl and along the line of the stem and floral detail inside to the centre of the bowl. There is a wonderful curve to the end of the stem. No backstamp but attributed to Samuel Barker of Don Pottery, Swinton Yorkshire. A small very minor blemish inside the bowl with a little wear to the bowl rim and a couple of small areas of wear and loss of glaze to the stem. Gorgeous small ladle with pattern inside the bowl and to the top of the stem. No backstamp. Excellent condition. With gilt. Large ladle with main Madras pattern printed inside the bowl and very pretty floral pattern to the top of the stem. There is some wear to the gilt, a few minor glazing blemishes underneath the bowl and a touch of wear to the stem but overall a magnificent piece. With gilt. Gorgeous large ladle with floral pattern inside the bowl and gilt spatter decoration. No backstamp, but we believe this is to be by Doulton. A little minor wear to the end of the stem, otherwise excellent condition. Lovely little ladle with pattern inside the bowl, floral detail along the stem and moulded decoration to the end of the stem. No backstamp. Light all over crazing with a little minor wear to the rim of the bowl and the stem, overall excellent condition. With gilt. Gorgeous little ladle with ornate embossed detail to the tip of the stem. No backstamp. Excellent condition.